Since the launch of Big History Project (BHP), we’ve partnered with the University of Michigan to carefully study the curriculum’s impact on student writing. The results have been remarkable. Across public, Title I, and private schools, students have shown significant gains over the course of the school year. The secret of this success is simple: Writing skills are foundational to BHP. Students taking the course write a lot, receive consistent feedback, and have many opportunities to act on that feedback. By offering a wide variety of texts, Investigations (which are similar to DBQs), and exercises, teachers can regularly and purposefully help students develop their writing skills. To date, the research study has focused solely on providing us with insights into the efficacy of the program. Individual submissions have been anonymous, and school- and student-level results have not been shared with teachers or students. As the program has grown, the chorus of teachers who want access to individual results has grown louder. 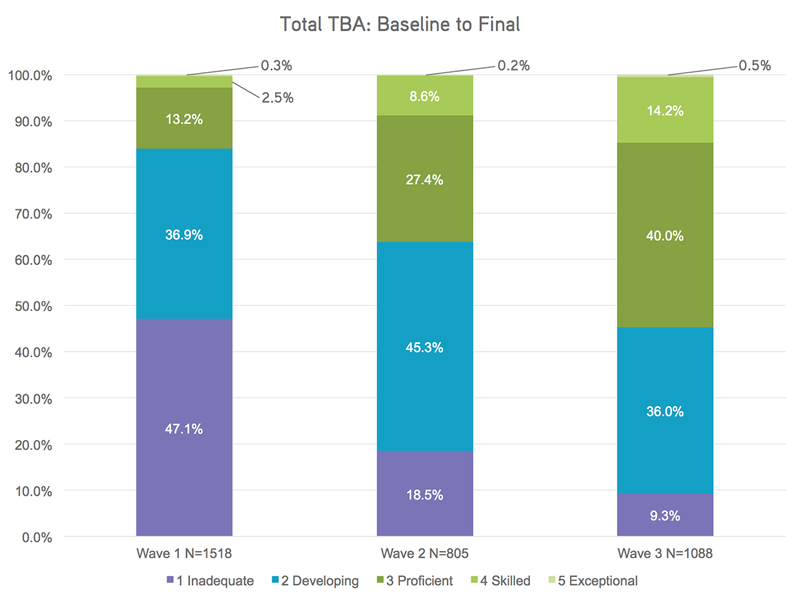 The more they’ve seen the research results, the more they’ve wanted to use the individual scores to develop specific improvement plans for their students. We’ve heard this chorus. In response, we’re introducing a new service—BHP Score. Together with Arizona State University (ASU) and the University of Michigan, we will offer BHP teachers and students direct access to writing feedback, which will create new formative assessment opportunities without placing increased demands on already overloaded teachers. Here’s how it works: Students write responses to the Investigations in Units 2, 6, and 9, and then submit them via the course website. When all of the students’ essays are in, the teacher submits them via the website. 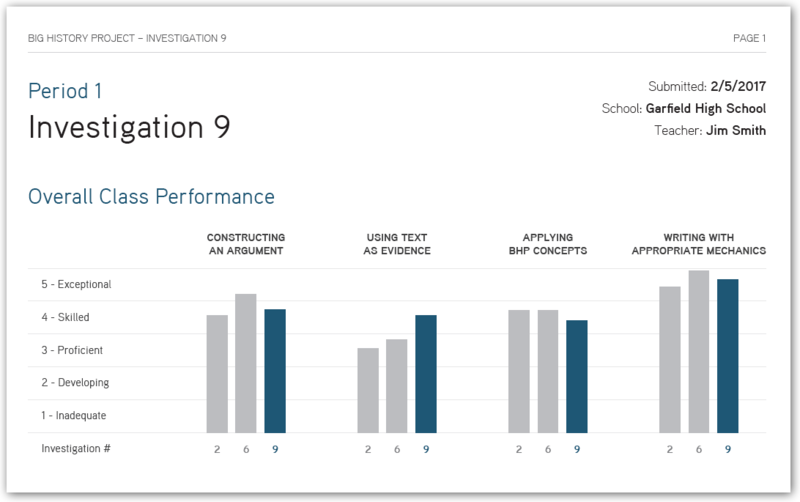 A short time later, the trained evaluators at ASU will return a report that includes a result for each student, measured against the standard BHP writing rubric. The report also provides a class summary, as well as a page detailing each student’s score in four areas: content knowledge, use of evidence, construction of argument, and writing mechanics. We know that it can take nine hours to grade the essays of just one class. There’s a limit to how much more you can do. At the same time, we feel strongly that students would benefit from additional formative feedback. We realize that in order to provide that formative feedback, we need to provide support to teachers. This is what we hope to accomplish with BHP Score. The best assessment of student work comes from the teacher that knows and cares about that student. BHP Score doesn’t change that. What it will do is create opportunities for a teacher and student to talk through the writing feedback and identify areas and strategies for improvement. This is a formative assessment program, not an entry in the grade book. The evaluators at ASU will be trained by the team at the University of Michigan, the Big History Project team, and ASU faculty. To maintain a high level of quality, scoring will be reviewed to ensure consistent application of the standards. BHP Score will become in late June 2016. It will only be open to teachers of the Big History course, so be sure to register at: http://school.bighistoryproject.com. Registration is free, fast, and easy. If you’re interested in learning more about BHP Score, email us at score@bighistoryproject.com. HOW DOES BHP WORLD EXTENSION ALIGN TO THE NEW YORK STATE WORLD HISTORY STANDARDS?